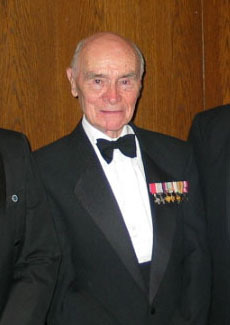 WING COMMANDER PHILIP PATRICK MBE, DFC, 149 Sqn, 7 Sqn PFF, 582 Sqn PFF. Born in Edinburgh in March 1915, Philip joined the RAFVR on September 3, 1940 and after flying training his aptitude for multi – engined aircraft singled him out for training as an instructor, He was awarded his wings and was posted to Central Flying School RAF Cranwell instructing on twin engined Oxfords. After a period of instruction Philip served with 149 Sqn at Lakeneath from July to December 1942 flying the Stirling aircraft and completed a full operational tour. His DFC was gazetted 9/2/43. After a period of rest at RAF Waterbeach and married with a one year old son, Philip volunteered to operate again, in November 1943 and was posted to 7 Sqn, Oakington, as 0C “C” Flight Pathfinder Force where he flew his first operation on December 2nd 1943 to Berlin. From December 1943 to March 1944 Philip flew 21 operations with 7 Sqn including nine trips to Berlin! duties varied from Supporter,Backer-Up, Blind Marker, Special Blind Marker and Illuminator. With effect from the 1st April 1944, “C” Flight of 7 Sqn, aircraft and personnel moved to RAF Little Staughton and with a flight from 156 Sqn, formed No 582 Squadron, still within 8 Group PFF. 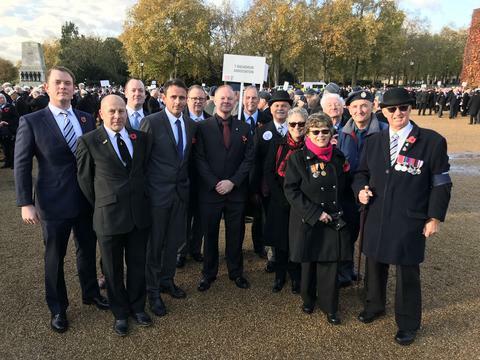 The Association was represented by 13 ex and serving Squadron members along with other Association and Commitee members. During the march past the Cenotaph the Association featured in the BBC coverage with an extended view of those marching and a brief description of the Squadron history and losses. After being dismissed we retired to the Opera Bar of "The Chandos" public house just off Trafalgar Square.